Carrots and spinach, our first recipe, is a combination which benefits almost every organ in your body and enhances immunity. With a couple of other ingredients to spice it up, it is a tasty and simple recipe for winter. 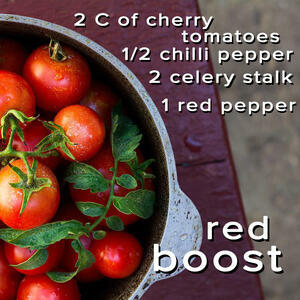 Recipe #2 is great for thoise who like things a little bit spicier. By combining celery with red vegetables, it packs a strong punch against colds. If you like you juice more on the sweet side, the third recipe is for you. 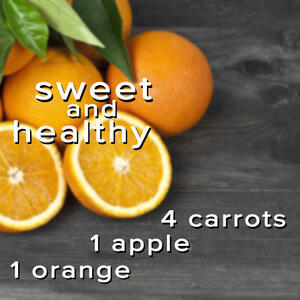 A classic combination of orange, apple, and carrots, it's one that your kids will like too. Remember, an apple a day keeps the doctor away. Colds occur when the body is weakened, so a great way to prevent them is to make sure your body has what it needs. This combination of carrots, spinach, lemon, and ginger will give your body a great nutritional boost. And if you've never juiced greens, spinach is a great one to start with. It juices easily, is packed with nutrients and iron, and has a very mild flavor. Our advice: If you plan to juice a lot of root veegtables and greens, the best type of juicer for that is a horizontal cold-press juicer. Phytochemicals from red fruits and vegetables provide you with good protection against colds, and are also good for heart disease and cancer (especially prostate cancer). For smokers, this juice should be mandatory! PS - Cherry tomatoes are preferred for juice recipes because of their high ratio of juice to pulp compared to larger tomatoes. A simple recipe that is sure to be a hit with kids. Vitamins A and C are a big part of this. If you want to give it the most cold-fighting power, add a piece of ginger. But be careful, a little ginger goes a long way. 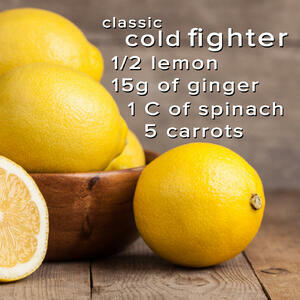 Looking for more recipes against colds and flu? Take a look at out first article featuring some crazy ingredients like potaotes and onions.